I remember when I got my first dress form. It was a gift from my father and a surprisingly thoughtful one at that. In the beginning I was too scared to really use it to its full potential. I'd still use patterns and them fit them on the dress form which was good too but it wasn't until later when I began making my own dresses that it became essential. I assume all of you at one point or another have seen Project Runway and in turn have seen the way the dress forms are used. It's not as mysterious as you might imagine. 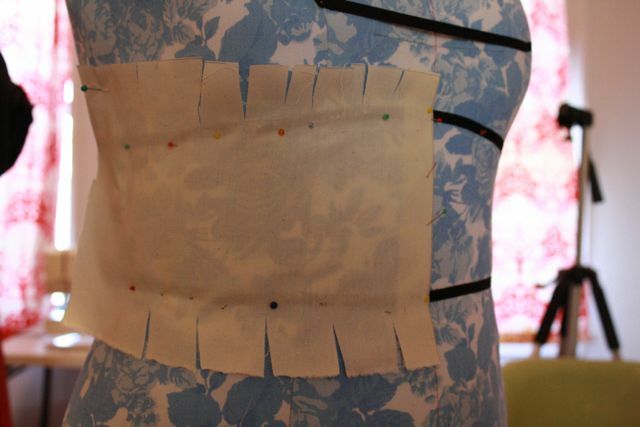 What I do is pin on muslin and cut. That's it. Some tips: I only cut one side of my pattern then cut my fabric on the fold so that both sides are equal. I do one piece of the pattern at a time. I fit the pieces together in the end. I try it on as I go because dress forms aren't perfect. I trace out my lines on the muslin while it's pinned to the dress form (but you could use tape on the form as your guide too) then cut. And don't forget to add seam allowances after. That's how I do it. I've never been to fashion school so I'm betting there are better ways to go about making a muslin pattern but this way works for me. And don't buy a display dress form (unless you are selling your products). They look pretty and are for display purposes only! Often their dimensions are ridiculous and obviously not adjustable. Many times I can't even fit a dress over the chest of my display dress form because it has a HUGE bust. If you look at dress forms in shop windows you will often see that the back is pinched with clips. I'm guessing it might be because they needed an extra large size to fit over the form's hips or bust. If you cannot afford an adjustable dress form. I recommend making one! I've even considered doing this because my dress form often yields *off* results. It looks like a lot of work and you have to have a partner but if you do it successfully you might have something even better than an expensive store bought version. Here's a tutorial from Threads Magazine online. Then if you really want to go all out there are the really pricey dress forms like the ones you see on Project Runway. You can buy one here. I've never used these but I'm guessing they are more expensive for a reason. For one thing I think you can adjust the shoulder width which I can't do with my Dritz. And that would come in handy. I'm always fixing the patterns of straps that are falling off my shoulders. And there you have it. My two cents on dress forms. If you have any suggestions or comments I love to read them! I want a wine cellar entrance like this. That is, if I had a wine cellar. An impressive cake that I believe is secretly simple. I look forward to reading the comments and see the suggestions. It's becoming obvious that I desperately need a dress form. I'm drawn towards a purchased one for the ease of being able to have it on a stand versus a handmade one, since I'm not sure how one would outfit dresses or skirts on one of those. But the beauty of those is that they really are YOUR form, and that's pretty appealing. Decisions, decisions! That first photo is of one of the classrooms at my school! How surreal, to see it on your blog! The dress forms really are a huge help. I have an adjustable one at home, but the main problem with it is that it's not padded enough to use pins on it. I'm searching around for a used dress form, but when you're doing that, you have to be careful of the year, because the body type will be different depending on what was trendy. A lot of forms from the 1990s are really, really thin for their size, whereas today they have a more defined waist, hip, and shoulder. Pant forms, which are suspended dress forms with legs instead of the wire cage, are great too, especially if you plan on making lots of pants, undies, or leggings. Gorgeous photos! My dress form looks like the ones in the top photo. I inherited it from my Grandmom. I look forward to these posts each day! Too bad there are only 10! I am a crafter and I sew, and I am still learning. A dress form is now #1 on my list! You can use the coupon, that's how I got mine. I found my dress form at goodwill for 25$ Its one of the old-old school types with lots of adjustable parts. I absolutly love it! 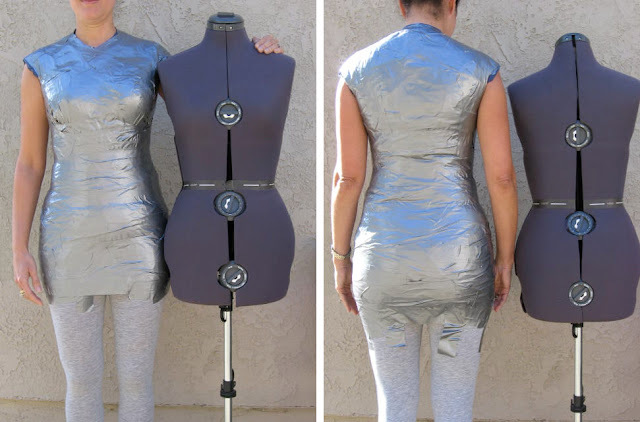 I also make a duct tape one for my 5 year old, its great because I usually sew at night when she is asleep and I can check the size of the dress without waking her. I have the Uniquely You dress form. It takes some work because you do have to have someone help you fit the cover, but when you do, you have a dressform that fits you exactly! Its awesome! And you can buy extra covers if you ever need another one. I know they are on ebay all the time for 140-ish?? I got mine used on ebay for around $80. I absolutely adore my dress form. I have a dress form from Fabulous Fit. It's been a revelation as far as fitting and seeing things on. I do wish I had researched dress forms a bit more when I was purchasing, because I think now I would choose a Wolf form, however, at one point I'm determined to transform my dressform into my absolute perfect measurements. Well at least almost near perfect. At that point I would love to try my hand at draping a little. Oh the excitement! Buy a dress form! You'll never regret it! Jessica, I got an 80% scratch-off too -- and I used it for my dress form too! I think mine was $50 ($250 originally), but they charged me a little extra on that for shipping, since they didn't have the right one in stock. But . . . I still haven't used it -- it doesn't even have a name (!) -- so I really hope for more posts on that. Many years back I saved up enough money to buy a dress form from JoAnn's. Of course I wanted a fancier one but I think I have gotten good use out of this one. It was worth the money. I think I paid $100. There are projects I couldn't have done without it. Wedding dresses being the most crucial. The first picture took me back to college days and I almost cried. I've been wanting one of these! I think I'm going to go for the duck tape version for now while I save for a nice one! Now this one I'm one hundred percent behind. I want a dress form so much! There have been many times when one would have saved my project. Isn't the whole point of making it yourself so you can have something that fits you perfectly? I just can't get that perfect fit because I don't have a dress form. It's on the list! I want the Dritz adjustable one like you have so I can use it to make something for me and then turn around and use the same dress form to sew for my daughter. I have alwasy wanted one of these so badly! unfotunatly they dont really make them here in NZ, and the ones they sell in my sewing store are completly plactic and so tinny. I would'nt mind paying more for better quality, not so keen on the shipping cost though. Very Expensive!! Yay, I have this item, too! I have an industrial form...like the top picture. 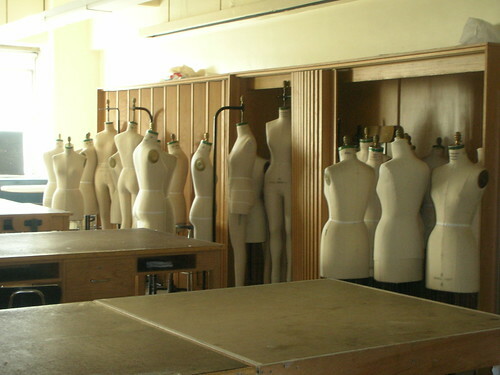 When I worked in the apparel industry I knew a patternmaker that was selling hers. It was in great condition, and I bought it for $150.00, which is good considering they last forever if it's taken care of. 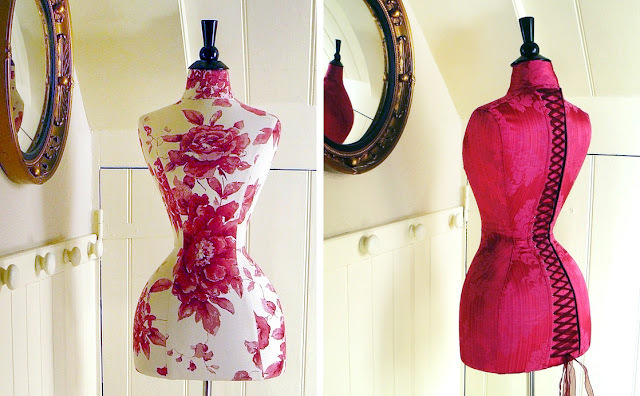 I've always wanted a dressform, but don't make too many clothes for myself so never looked into it too much. Lately I've been thinking of making more clothes for my kids and they can pose and model for me if necessary! My friend and I spent a day making our own and they were brilliant. I used mine to make my wedding dress and it fit like a glove. I would recommend using the BROWN PAPER TAPE instead of duct tape though, as duct tape is awful for your needles! It's a bit more work, but trust me, it's worth it! I've got my own dress form, too! So far, she's been perfect for holding up hats and for helping me drape a wide shawl into a 20s style evening dress. She's a duct-tape type, filled with expandable foam from the hardware store, covered with old t-shirts. To pad out her lower half, I've filled pillowcases with fiberfill and pinned them to the correct area, then cinched them with ribbon. I haven't gotten brave enough to try draping anything else on her, and I don't use her for most regular projects. But she's handy to have around. But alas, she remains unnamed. Kathleen--you mentioned something about your Dritz form being able to be lengthened so your shirts aren't short anymore, could you please share a little more about this? I have a long torso (+2" shoulder-to-tip and another +2" tip-to-waist) and have wondered if the Dritz forms could accommodate that modification. I always figured I'm too oddly proportioned, but maybe the form can adjust that much? I longed for a dress form for so long ... and now I have one and I don't use it, for the very reasons you mentioned. I just can't get the proportions right on my Dritz adjustable. I just don't find them to be very good quality, and I'm thinking of getting rid of mine. I've held on to it because I keep thinking .. maybe I'll drop all the measurements down and pad it back to my measurements instead. Oh, so great to read this post and the comments- I've just bought myself a dress form ($20 on ebay). I did go to design school, and that is pretty much exactly how we were taught to drape with muslin. There is no other secret way to do it that I'm aware of! I got an adjustable dress form at Goodwill for $8. It is my least favorite of my dress forms because it is hard to pin into, but it's the only one I have that I can make clothes for myself on without doing a lot of altering. I really need to make a custom form! I've heard of people making their own duct tape forms, and have been interested in the instructions - thanks for posting them! I may be too much of a beginner to really invest the time and materials in making one, but I'd like to think I NEED one. My Alta was used by my great-grandmother, Alta, who worked making dressed for Hollywood movies. Hence the name of my dress form. But, she is shaped like a 1950's gal, and to a hipless/waistless gal like myself, it makes fitting to the waist a little difficult :). Her adjustment parts are getting really old and parts are disappearing. I still use her often! Are we getting any more of these 'big ticket' articles? I was rather enjoying them. I DO TOO! I began the series as sort of a way to do an original post when I was too busy to make a craft. Lately, I've been too busy to even do a Big Ticket post. But I really love writing them and getting the feedback. I promise to have another one this week. Probably Friday. I got a Singer adjustable dress form a little over a year ago and can't imagine going back to life without one.